It’s pushing 3am on Sunday, and the Qazweeni family still hasn’t been seated. It's Memorial Day weekend, and they are waiting for a table at their local IHOP, located in Dearborn Heights, Michigan. The family of four is competing with both late-night revelers searching for pancakes to sober up, and the handful of other devout Muslim-American families for a table. It may seem like a surprising mix, but in recent years, a number of practicing Muslims make their way to the 24-hour breakfast chain each year during the 30-day-long observance of Ramadan. The Qazweeni family is there for suhoor, the meal eaten just before daybreak when fasting resumes. But without much time left before starting their next 17-hour fast, Atekeh Qazweeni ushers her two young sons and husband toward the parking lot. This weekend at least, the IHOP suhoor run will have to wait; the family of four has to find some other place to get their early morning meal. This particular IHOP is situated in metro Detroit, home to one of the largest Muslim-American populations in the country. Not far from the restaurant is Warren Avenue, a food enthusiast's paradise, where a cluster of traditional eateries, including Lebanese shawarma, Iraqi pastries, and gourmet Yemeni coffee can be found on neighboring blocks. While these eateries are a popular draw during Ramadan -- often staying open late nights and into the early mornings to cater to iftar (the meal that takes place after sunset when Muslims can break from fasting) and suhoor -- certain chains have also become popular amongst the Muslim-American crowd. Whether it be in Detroit, Houston, Southern California, DC, or Boston, IHOP is just as much a part of the Holy Month as prayer and the end-of-season celebration of Eid. “For my kids, not having ‘traditional’ food is the norm,” says Sadia Jalali, 38, of Sugar Land, Texas, a suburb outside of Houston. For those who are unfamiliar, suhoor takes place in the hours before fajr, or morning prayer. Since Ramadan is based on the lunar calendar, the timing of Fajr depends on where one is located and the day of the year, adjusting by a few minutes each day. Likewise, the sunset prayer, maghrib, signifies the end of iftar or the meal that officially breaks fast. During daylight hours, the devout abstain from consuming any food or drink, including water. What people eat between sunset and sunrise varies tremendously. Some break fast with elaborate feasts. Most, however, try to strategize to find the most efficient way to store the energy needed to sustain oneself all day, especially when Ramadan falls during the long, hot summer as it does this year. While it’s not exactly clear when IHOP became a fixture for Americans observing suhoor, what is certain is that it exemplifies how both Muslim and American cultures continue to influence one another and create something unique to the United States. Islam's impact in the Americas dates back centuries with the Moors, who ruled Spain for nearly 800 years and heavily influenced the Spanish language, which was thus carried over to Mexico. The first Muslims appeared in the United States in Virginia in the 17th century and in 1805, President Thomas Jefferson hosted an iftar dinner at the White House. More widespread migration to the US by Muslims from countries like Yemen and Lebanon began in the mid-1800s until World War I. Many settled in Dearborn, Michigan, and at the start of the 20th century, many were drawn to work in Detroit's automotive factories. Waves of Muslim immigrants from more than 20 nations have also concentrated in various regions of the United States, especially Houston; DC; Cedar Rapids, Iowa; Philadelphia; New York; and San Francisco. 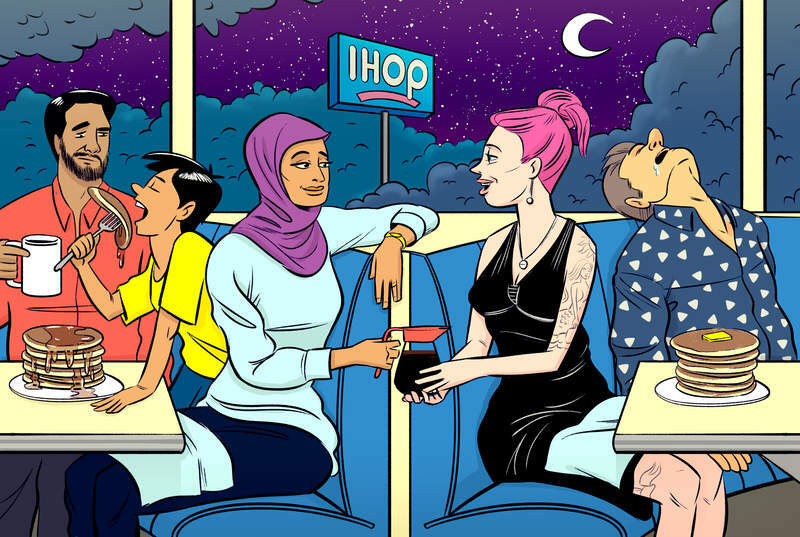 In that respect, suhoor at IHOP, the Los Angeles-based breakfast chain that also sells burgers, is an example of two cultures seamlessly colliding. 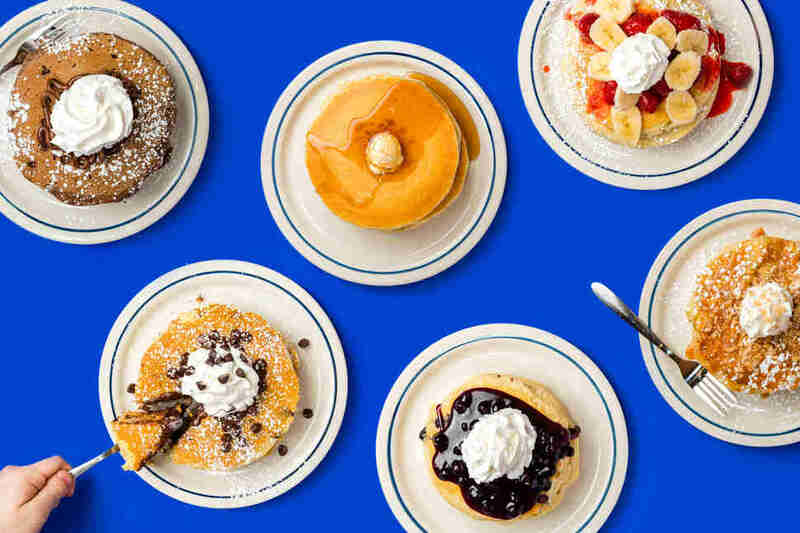 With more than 1,600 locations, mostly in North America, nearly all stores are run by independent franchisees, making it difficult for the restaurant’s parent company, Dine Brands Global, to quantify just how prevalent IHOP visits are during Ramadan. Stephanie Peterson, an IHOP spokeswoman, did say that in its 60 years in operation, the chain has prided itself in being supportive of families of all backgrounds.“When you have holidays like this, just seems to fit so well with the kind of comfort of the brand and the fact that we do have that welcoming quality,” she says. For Jalali, having grown up in the Houston area most of her life, IHOP makes more sense for a pre-dawn meal than what she consider to be more traditional food. “Think it's just that we're Muslim-American, I was born here, my kids were born here, this is standard fare for us. IHOP is the tradition,” says the mother of four who works as a marriage and family therapist. Besides, where else can she get her fill of protein-heavy foods like eggs and turkey bacon, alongside her favorite -- chocolate chip pancakes -- needed to sustain for the upwards of 18 hours of fasting that follow come sunrise? Heading to chains like IHOP during Ramadan isn't a recent phenomenon. 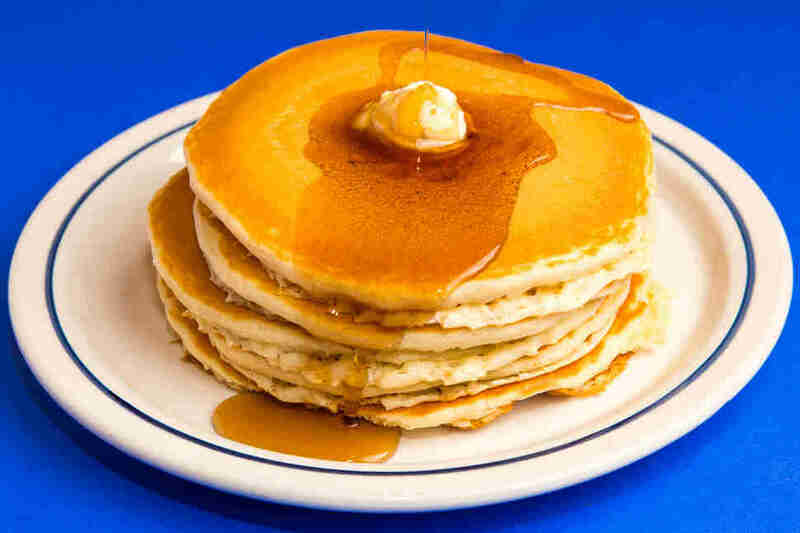 Basil Maqbool, a pharmacist in Murrieta, California, a city of just over 100,000 about 80 southeast miles from Los Angeles, has kept this late-night pancake ritual alive with his childhood friend since the age of 13. He says they first started with the competitor 24/7 chain Denny’s after the two dared each other to stay up as late as possible between iftar and late-night prayers. They’ve been coming back every year for more than two decades, weathering cross-country moves, college, and starting families. Now that their kids have started fasting, they’ve included their children in the annual rite of passage. “It makes Ramadan kind of stand out, you can have food at home, but it turns into something that the kids look forward to,” says Maqbool. The decision of whether to hit up IHOP or Denny’s really depends on which diner is more crowded, says Maqbool, 40. For the Qazweeni family in Dearborn Heights, the choice this Memorial Day weekend was home. The family of four arrived at the restaurant just after 2:30am, but still hadn’t been seated by 3am, so they left to give themselves enough time for a quick meal at home and prayers. A manager at the IHOP told me the store was significantly understaffed that night, preventing the host from filling roughly half of the available tables and booths. When I arrived shortly after the Qazweenis, I was told the wait would be at least 35 minutes after a handful of other parties were accommodated. Of the roughly 15 seated tables with customers and the 12 or more guests waiting for a spot, about half identified as Muslim or wore traditional attire such as hijabs. Qazweeni said this would have been her family’s first experience with IHOP for suhoor. She grew up in Southern California herself and heard about the ritual from friends. In the past, her Ramadan traditions included trips to Iraq to visit her parents. With school for her two sons, 12 and 7, overlapping with the Islamic holiday season this time around, the trip overseas will have to wait. Until then, she’s hoping to make it to IHOP at least once this Ramadan season. Serena Maria Daniels is an award-winning freelance journalist and founder of the Detroit-based food and culture site, TostadaMagazine.com. Find more of her work at her website and on Instagram and Twitter @serenamaria36.